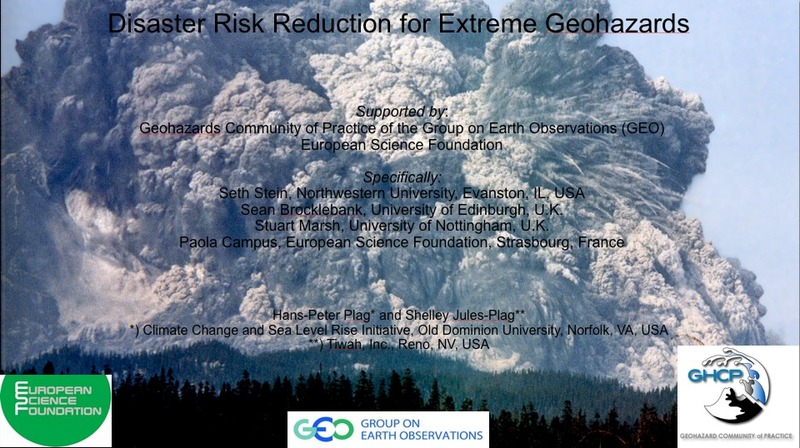 [November 20, 2014] Special Session on Extreme Geohazards at GEORisk 2014: A Special Session on Extreme Geohazards was organized at the GEORisk 2014 Conference in Madrid, Spain. Four presentations addressed the high risk associated with extreme volcanic eruptions and discussed options for improved monitoring and international governance for risk reduction. A panel discussion engaged the audience in developing ways to address the risk associated with low-probability high-impact events. 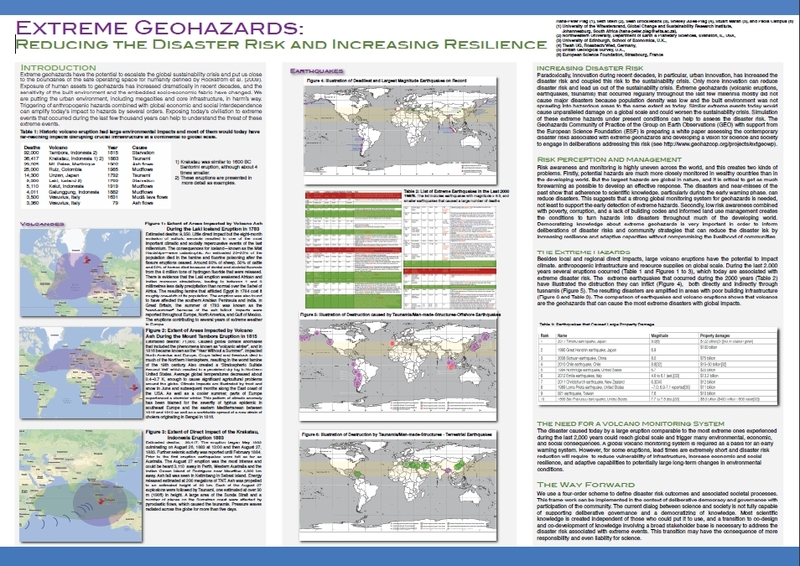 [August 29, 2014] White Paper discussed at IDRC 2014: A special session was organized at the International Disaster and Risk Conference in Davos, Switzerland. Five presentations addressed the high risk associated with an extreme volcanic eruption and options for improved monitoring, an international panel to assess global risks, and first steps leading to improved risk governance. 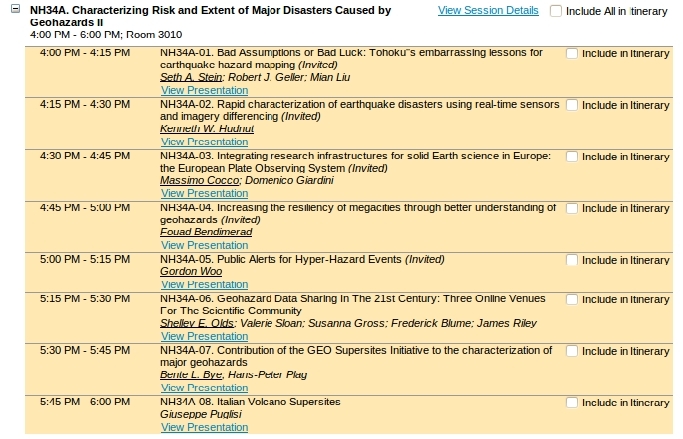 [15 July 2012] GHCP Session on Extreme Geohazards at GeoRisk 2012: A session on “Extreme Geohazards: Reducing Uncertainties and Disaster Risk” will be organized by the GHCP at the First IUGG GRC Conference on “Extreme Natural Hazards and Their Impacts” (GeoRisk 2012), which will take place December 8-12, 2012, at Chapman University, Orange, California, USA. See the Announcement for details. 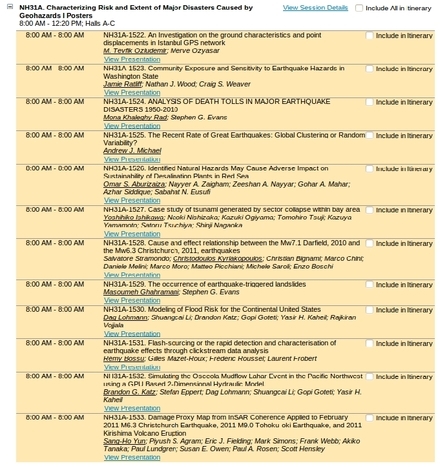 [10 May 2012] The First IUGG GRC Conference on “Extreme Natural Hazards and Their Impacts”: The First IUGG GRC Conference on extreme natural hazards and their impacts will take place on December 8-12, 2012, at the Chapman University, Orange, California, USA. See web page ... for more details. 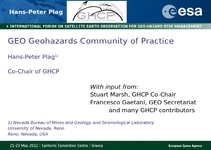 [27 January 2012] Meeting of the GHCP at EGU: The GHCP is convening a meeting collocated with the Annual Meeting of the European Geosciences Union (EGU) in Vienna. The GHCP meeting will take place on Wednesday, April 25, 2012 from 8:30 to 12:30. Read more .... 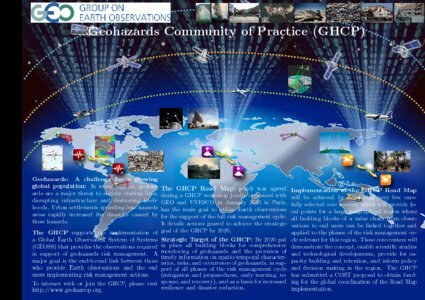 The objective of the meeting is to make progress toward the implementation of the GHCP Roadmap and the Declaration of the ESF/COST Science conference Understanding Extreme Geohazards: The Science of the Disaster Risk Management Cycle. [25 January 2012] Conference Declaration available: The declaration of the ESF/COST Conference Understanding Extreme Geohazards: The Science of the Disaster Risk Management Cycle is now available here ... The declaration emphasizes outreach and education as well as risk reduction through reduced exposure and vulnerability as key components of the disaster risk management cycle. 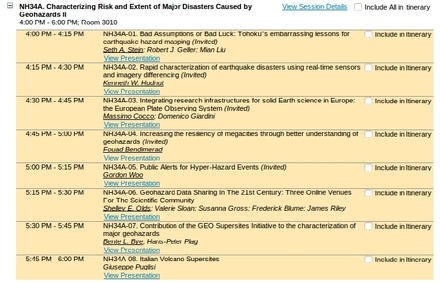 [8 December 2011] AGU Session on major geohazards: The GHCP contributed to the organization of Sessions NH31A (poster) and NH34A (oral) on “Characterizing Risk and Extent of Major Disasters Caused by Geohazards” at the AGU Fall Meeting. In the oral session, several invited papers addressed aspects of risk management and disaster reduction related to geohazards. 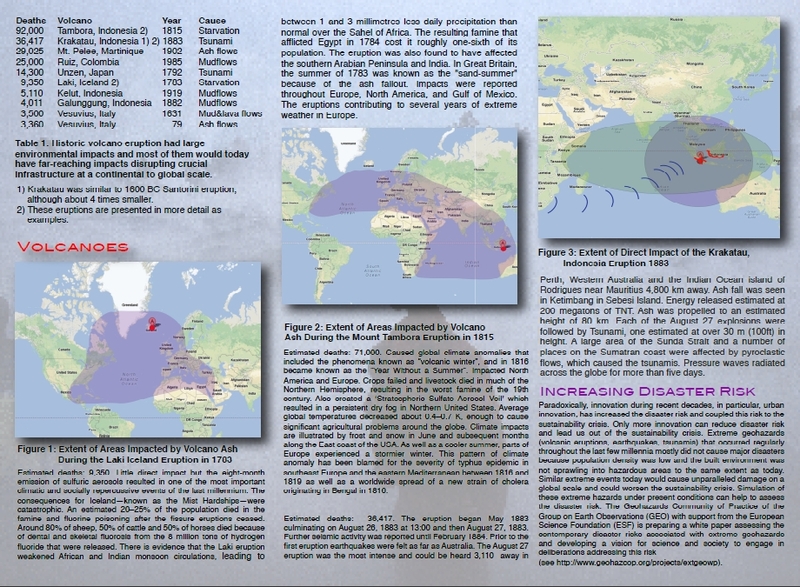 Likewise, several posters were also focusing on the impacts of disasters caused by extreme geohazards on society. Program of oral Session NH34A. Program of poster Session NH31A. [2 December 2011] ESF Conference on extreme geohazards: The European Science Foundation (ESF) conference on “Understanding Extreme Geohazards: The Science of the Disaster Risk Management Cycle” was held on November 28 to December 1, 2011 in Sant Feliu de Guixols, Spain (near Barcelona). The conference brought together 55 leading experts and young researchers from four continents, who discussed scientific and societal aspects of the four phases of the risk management cycle (preparedness, early warning, response, and recovery) as they relate to disasters caused by extreme geohazards. The conference was organized under the lead of the GHCP. For details see the conference page. Participants of the European Science Conference on "Understanding Extreme Geohazards: The Science of the Disaster Risk Management Cycle." [1 September 2011] GHCP organizes Conference on extreme geohazards: 3rd and final Call for Papers published: The last CfP for the ESF Conference on Understanding Extreme Geohazards: The Science of the Disaster Risk Management Cycle has been published here. Deadline for applications and abstract submission is September 18, 2011. For more details, see the Conference web page. 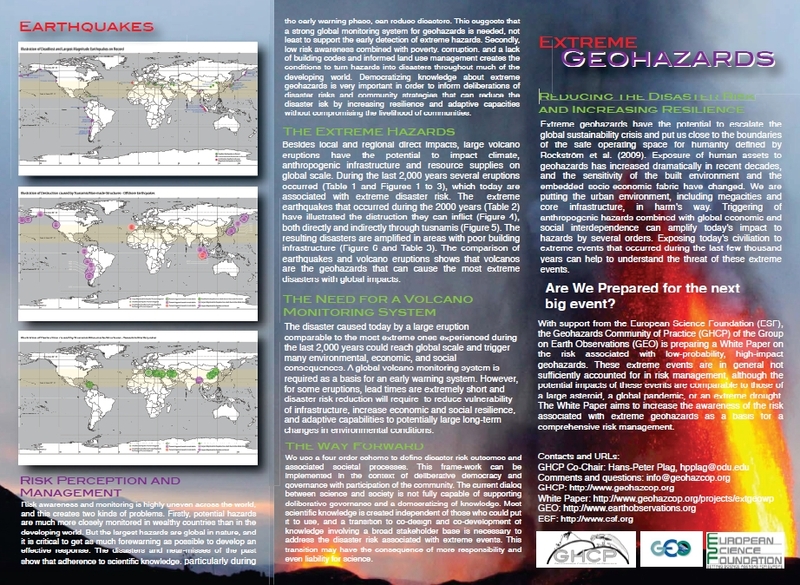 [4 July 2011] GHCP organizes AGU Session on major geohazards: The GHCP is organizing Session “NH04. 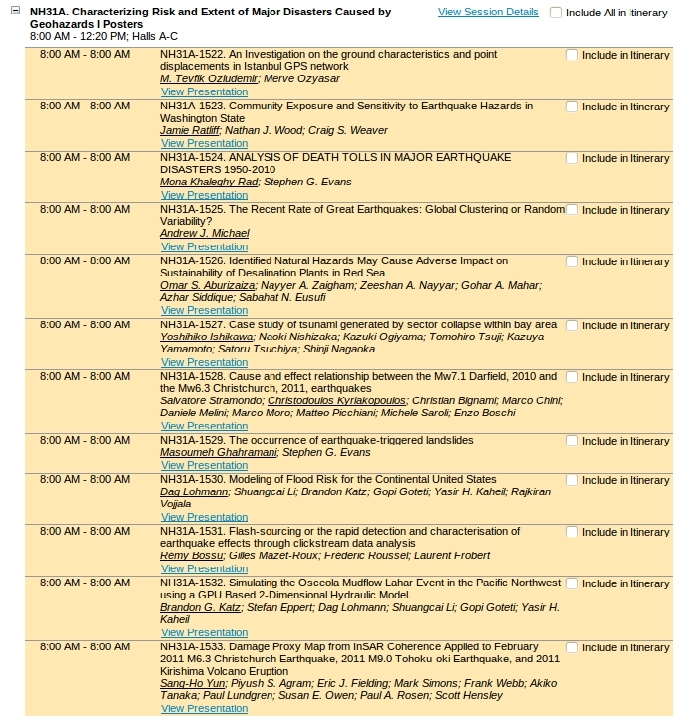 Characterizing Major Disasters Caused by Geohazards” at the AGU Fall Meeting. See the session description. Deadline for abstract submission is August 4, 2011. 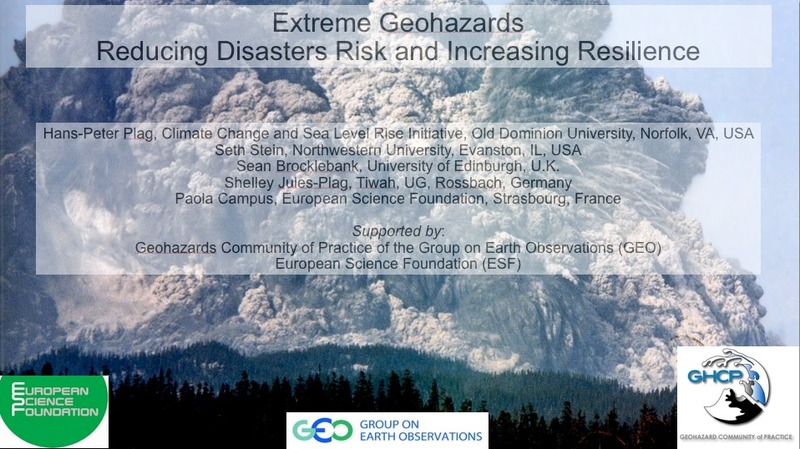 [3 June 2011] ESF Conference will address extreme geohazards: A European Science Foundation conference to be held on November 28 to December 1, 2011 in Sant Feliu de Guixols, Spain (near Barcelona) will address extreme geohazards. The conference titled Understanding Extreme Geohazards: The Science of the Disaster Risk Management Cycle will bring together leading experts to discuss the four phases of the risk management cycle (preparedness, early warning, response, and recovery) as they relate to disasters caused by extreme geohazards. The conference is organized under the lead of the GHCP. For details see the conference page. [20 April 2011] GHCP Workshop postponed: The 2nd Workshop of the GHCP, which was scheduled to take place on May 6, 2011, in Antalya, Turkey, has been postponed. The workshop will take place in the August/September time frame. Besides discussing the implementation of the GHCP Road Map, a main focus will be on characterization of major disasters and the Supersite Initiative. Dates and location of the workshop will be made available here in the near future. [14 October 2010] 2nd Workshop of the GHCP: The 2nd Workshop of the GHCP will take place on May 6, 2011, in Antalya, Turkey. The workshop is co-located with the Gi4DM 2011 conference. The focus of the GHCP Workshop will be on the finalization and acceptance of the GHCP Road Map and steps toward the implementation of this road map. For more information see the workshop web page. 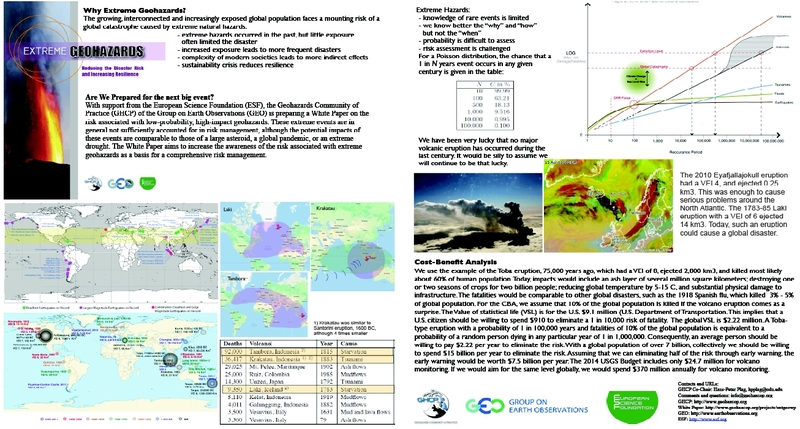 [14 October 2010] GHCP Poster for Ministerial Summit: A GHCP poster has been prepared for the Exhibition co-located with the 7th GEO Plenary and the Ministerial Summit on Earth Observations to be held in Beijing, China, on November 2-5, 2010. Download the complete poster as pdf.